Pimples on the scalp are generally caused by excess oil buildup and irritation. Scalp acne treatments help prevent blemishes by controlling oil buildup and keeping the pores clean. Small lifestyle changes, like adjusting your diet or using different hair products, can also help prevent scalp breakouts. Scalp acne blemishes are often covered by thick hair, making it hard to target them with typical acne treatments. Acne-fighting shampoo or prescription medication may help alleviate some of the pain and discomfort associated with those stubborn scalp pimples. Here’s what you need to know about this common skin condition. What causes scalp acne? All pimples occur for more or less the same reason: because pores become clogged. The root cause of acne is an oily substance called sebum. The ducts that lead to the sebaceous glands that produce sebum can become blocked by keratin, a protein that makes up hair. These plugged ducts create an an environment for C acne bacteria to thrive, which causes inflammation. This is what causes essentially all acne outbreaks. In the case of the scalp, clogged pores are really just clogged hair follicles. Dead skin cells, excess oil, bacteria and debris from your hair products get trapped in the follicles and cause blemishes. On top of that, our scalp’s pores are subject to harsh heat, razors, and certain chemicals that can cause irritation and exacerbate skin conditions. These blemishes often pop up when shampoo, conditioner and styling products — especially hair gel and hairspray — leave residue on the scalp. They’re more likely to occur if you don’t wash your hair often enough, as shampoo helps purge the pores of any excess debris. People with naturally oily skin and those who are prone to sweat are also more likely to suffer from severe cases of scalp acne. Various factors contribute to the scalp’s overall health. If you have a particularly dry scalp, it’s tempting to use oily shampoo, except this type of shampoo can clog pores and make flushing debris away more difficult. By the same token, people with oily hair often use shampoos and hair styling products that reduce oil, which can dry the scalp and cause irritation. As you can see, preventing scalp blemishes is a delicate, complex task. Not washing your hair enough is the No. 1 reason why you might experience regularly occurring scalp blemishes. There’s no one-size-fits-all recommendation for how often to wash your hair — just make sure you’re paying attention and shampooing when it starts to feel oily. And always wash your hair after a sweat session to prevent clogged follicles. Another one of the most common causes of scalp pimples is using the wrong products. Do your best to avoid oily hair products, as these can contribute to excess oil that feeds the blemishes. Be wary of dry shampoo if you tend to experience scalp breakouts — these products just mask the oil and don’t actually remove it from the hair follicles. Anything you put on your head — from your headphones to your favorite hat to your go-to hairspray — may irritate the scalp, which can cause it to develop pimples. Make sure that anything you place on your head is clean and free of oils and be sure to always wash your hair afterwards. Excessive use of heated hair tools is also a no-no as they dry out your scalp and can lead to irritation. It’s important to note that scalp acne is often confused with scalp folliculitis, a more severe bacterial infection that occurs when bacteria grows in hair follicles. Scalp folliculitis causes small, itchy bumps that look like blemishes and may lead to permanent bald patches, hair loss and scarring. For these reasons, it should be treated differently than scalp acne. Doctors recommend using anti-dandruff shampoo, oral antibiotics and steroids to treat the condition. Hair follicles are similar to other pores on the skin. They contain sebaceous glands that produce oil in order to keep your hair soft, shiny and healthy. But too much oil is the enemy of blemish-free skin, be it on your face or scalp, so it follows that treating scalp blemishes is not unlike treating skin problems on your face and the rest of your body. Your first step is to minimize oil production and irritation. As weird as it may sound, it can be beneficial to put some of your favorite facial acne-fighting ingredients on your scalp. But don’t worry, you won’t need to use your everyday face wash or skin care products on your hair to get results. There are hair care products fortified with proven pore-cleansers that are designed specifically for targeting acne on the scalp. Shop for shampoos that contain salicylic acid or glycolic acid. These acids help to naturally exfoliate the skin, flushing away dead skin cells to prevent acne. Glycolic acid is also designed to help kill bacteria that become fodder for blemishes. Tea tree oil and jojoba oil are naturally antibacterial and antifungal, respectively, so they can help fight acne on the scalp as well. Make sure to avoid any products containing benzoyl peroxide, because while they might help eradicate stubborn pimples, they can also cause bleaching or discoloration of the hair. Clarifying shampoos are excellent at removing product buildup, excess oil and debris, but they’re known for drying out your hair and scalp, so it’s best to avoid these treatments as well. You already know that there are several prescription medications on the market to treat enlarged pores and facial acne. But what about RXs for the scalp? If you think you have a severe case of scalp acne and have tried various over-the-counter treatments to no avail, talk to your dermatologist about getting a prescription treatment. These medications work the same way as facial acne prescriptions, so they’ll also help clear up blemishes on your face at the same time. All of these treatments function in the same manner, but may be taken orally or applied directly to the scalp as a topical medication. They help eliminate irritation on the scalp to prevent it from developing blemishes. Your dermatologist may recommend topical antibiotics, steroid cream or steroid injections. He or she might also recommend oral medications such as isotretinoin, which is often prescribed to treat cystic acne. Scalp acne can be improved by making small lifestyle changes. Of course, we already know that upping how often you wash your hair can significantly reduce your likelihood of developing stubborn and painful pimples, but research shows that adding nutrients to your diet — especially vitamin A, vitamin D and omega-3 fatty acids — can also help clear up acne on the scalp. According to the American Academy of Dermatology (ADA), there’s growing evidence linking acne and diet, so adjusting what you eat may be a good way to eliminate blemishes from your scalp and skin as a whole. What’s more, your day-to-day stress level may contribute to your likelihood of developing breakouts on the face and body. In general, dermatologists agree that stress won’t cause new flare-ups of acne, but it can worsen existing conditions. As best as you can, try to avoid high-stress environments, and set some time aside to exercise, meditate, and socialize. Sometimes, physical pore extraction will also help prevent serious cases of scalp acne. For example, Dr. Cynthia Bailey offers a scalp scrubber that encourages physical removal of scale, dirt and oil buildup on the scalp and in the hair. According to Dr. Bailey, this type of massager lifts away blemish-causing agents while helping you prepare your hair for a more thorough rinse. A gentle scalp massage is another good way to help heighten the benefits of certain acne-busting scalp treatments. Whether you massage with your fingers, a scalp scrubber or your hairbrush, the increased movement will help deliver medications and treatments deeper into the hair follicles and allow you to clean the pores of bacteria and oil. Scalp massages also help lubricate and condition the scalp, preventing dryness and dandruff. Here are some of the top-rated tools and products to help keep your scalp healthy. 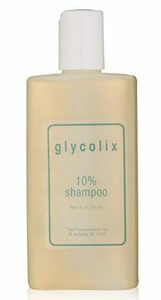 Made with ultra-pure glycolic acid and salicylic acid, Glycolix 10% Shampoo uses the acids’ combined powers to exfoliate dead skin cells and unclog pores. This makes it a great choice for getting rid of scalp acne. It is also pH-balanced, which helps soothe your scalp and protect your hair. This purifying shampoo uses the antibacterial and antifungal properties of tea tree oil to cleanse your scalp. 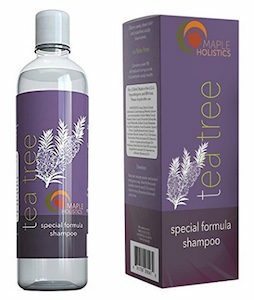 In addition to getting rid of scalp oil and acne, Maple Holistics Tea Tree Oil Shampoo can be used to treat scalp dryness and itchiness. This shampoo also contains lavender, rosemary, jojoba, and argan essential oils to naturally fight scalp acne. 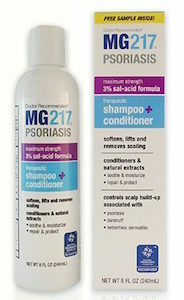 If you are looking for a shampoo that will improve the overall health of your scalp while getting rid of pesky scalp pimples, look no further than MG217 Therapeutic Shampoo. Containing 3% salicylic acid, this maximum strength shampoo soothes irritation and dryness. 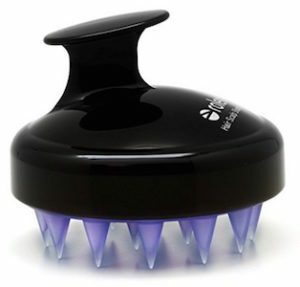 Using a scrubber to massage your scalp can be a great addition to your scalp care regimen. 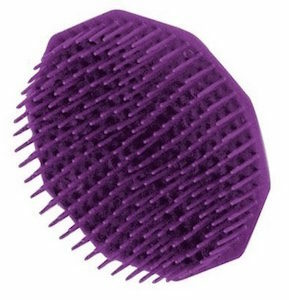 Scalpmaster Shampoo Brush is a simple and low-cost option that uses hard plastic bristles to scrub away excess shampoo and build-up, thus preventing scalp acne. Note however that its durable plastic build can be irritating to sensitive scalps. If you want something more sophisticated than a basic plastic brush, Rolencos Hair Scalp is a more advanced alternative to the Scalpmaster. With its soft, flexible tourmaline-infused bristles, the Rolencos Brush strengthens your scalp and roots as you scrub, without being too harsh.